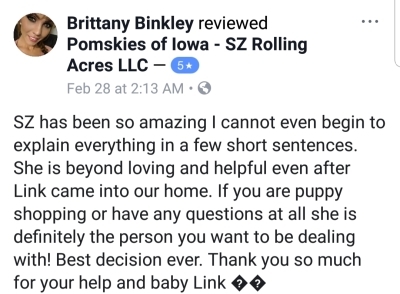 "...we’ve been connected to a whole new family now through our choice to purchase a pup from SZ Rolling Acres LLC." I appreciate the support of the breeder during the process; not just when looking to buy a puppy and choose a puppy but even after our puppy came home with us. 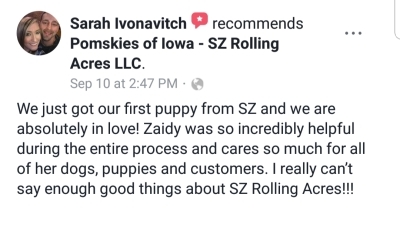 Our dog is a huge part of our lives and we’ve been connected to a whole new family now through our choice to purchase a pup from SZ Rolling Acres LLC. She uses Facebook to stay connected after the purchase. 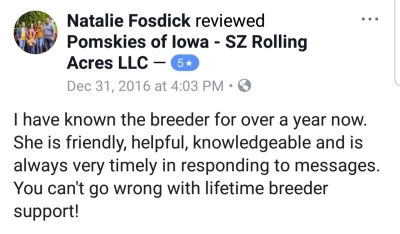 It’s great to keep connected to our breeder and others who have purchased from them as well. The breeder & community is extremely helpful with any questions that arise which puts our worries at ease. - Gina C.
"A+ rating across the board in every aspect!" 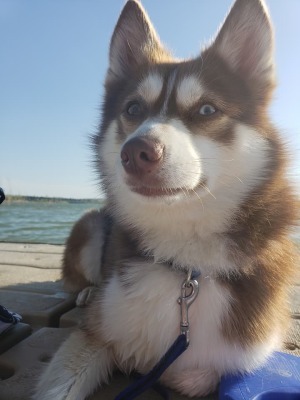 Working with Zaidy to acquire my own Pomsky was a great experience. She is extremely easy to work with and always willing to help. The dog I received from Zaidy is the first dog I've ever owned myself. So naturally I had several questions with certain scenarios and anytime I texted Zaidy she was extremely willing to help and gave me the best information possible. A+ rating across the board in every aspect! Will definitely be a returning customer in the future!! 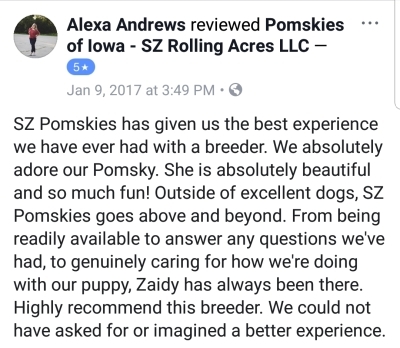 - Austin W.
"I recommend Kanzaidy's dogs more than any other breeder I have ever researched (and I have researched many!)" 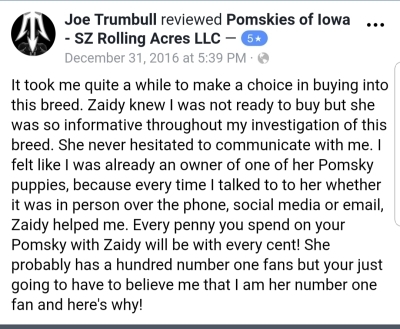 Our experience when buying "the love of our life, Henry" from SZ Rolling Acres LLC was as if Kanzaidy had been in business for decades and had a large business degree and yet, the most important detail for us was, that every step was personal and genuine. Kanzaidy is helping individuals and families responsibly enjoy high quality dogs. We absolutely are in love with the breed and take our search very seriously when looking for a healthy well adjusted dog. We found that in Kanzaidy's dogs. She takes extra steps to ensure that her pups are not just healthy and genetically clear but also well adjusted with socialization and other techniques that will only support the dog's socialization later in life. I recommend Kanzaidy's dog's more than any other breeder I have ever researched (and I have researched many!) She has a talent, gift and dedication that is like no other. I welcome any individuals to directly contact me via facebook to ask me questions, I will tell them how happy we are with our sweet Henry! - Sarah B. "Every week Kanzaidy would post updates about the puppies and if I had any questions she would respond immediately." 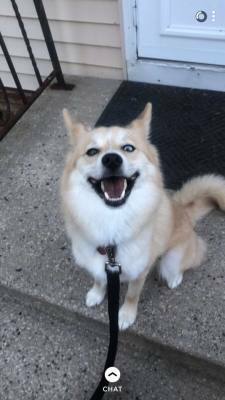 I was looking for a Pomsky for about a year and a half. 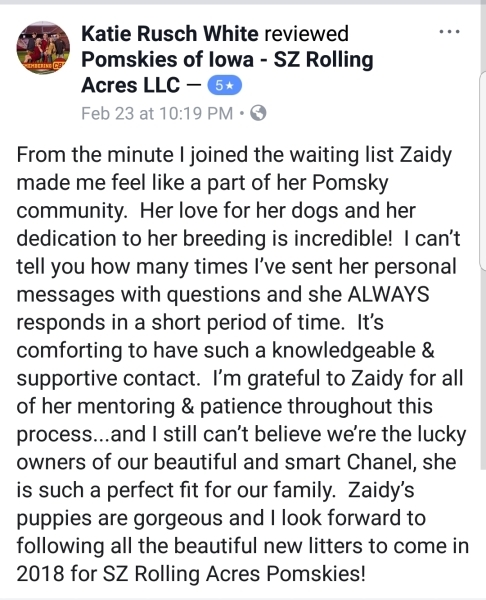 I fianlly came upon Kanzaidy's Facebook page, Pomskies of Iowa. I saw her first litter with Azula And I fell in love with her puppies. When Kanzaidy posted her next litter with Luka I was in and I got on the list. During the whole pregnancy with these F1 puppies she was letting us all know how Luka was doing and once the puppies were born she was posting immediately. Every week Kazaidy would post updates about the puppies and if I had any questions she would respond immediately. Even today if I have any questions about my pup she is polite, professional and responds back in record time. I would recommend Kanzaidy's Pomskys to anyone. We are constantly getting comments about our pup Zacara and every one I know now wants a Pomsky. If it was not for the fact that we have 4 other dogs plus our Pomsky we would get another pup from SZ Pomskies. 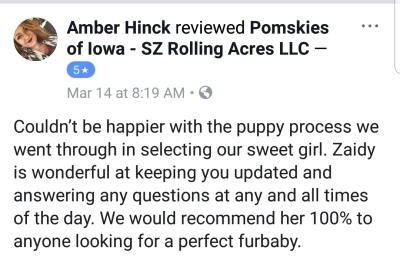 - Lori D.
"We are very satisfied with our puppy." 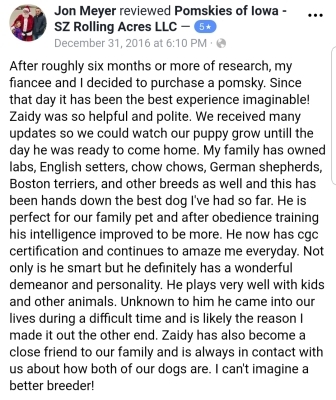 I highly recommend Kanzaidy as a trustworthy, honest, compassionate dog breeder. We are very satisfied with our puppy. We had weekly updates on progress. Thank you for caring and breeding. 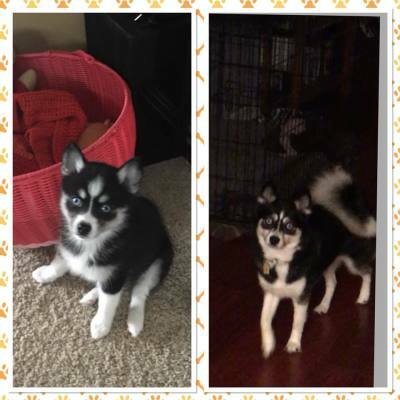 -Roy and Missy H.
"I would highly recommend purchasing your Pomsky from SZ Pomskies!" I purchased a Pomsky in Kanzaidy’s very first litter. With no history to back her up, I followed my gut in trusting that Kanzaidy was honest and ethical. I was not disappointed! She kept me informed throughout the process and when I picked my puppy up he came fully prepared to go home! I couldn’t have asked for a better companion! Blizzard is friendly, smart, and social and you can tell he comes from great lines. I would highly recommend purchasing your Pomsky from SZ Pomskies! - LeeAnne R.
"She is honest and very caring which I think is a very good quality to have when you are a dog breeder." I bought a puppy from Zaidy over a year ago and we kept in touch and bonded since buying that puppy. She has become what I consider a really good friend. I have got to watch her grow and I don't want to say business grow because to her it is much more than a business. She adores each and every puppy that is born and bonds with each one of those puppies before they go on to their new homes. She is honest and very caring which I think is a very good quality to have when you are a dog breeder. 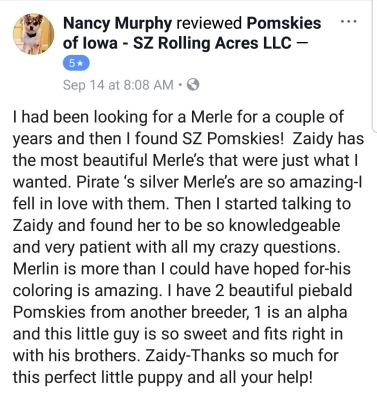 As much as you can see or read everybody that has bought a dog from Zaidy continues to have contact with her as their puppies grow. She honestly is the only one I would trust my pups with. 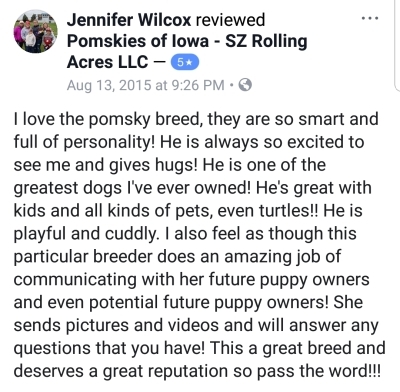 - Marilyn G.
"I would recommend these guys to anyone thinking about the Pomsky breed!!!" 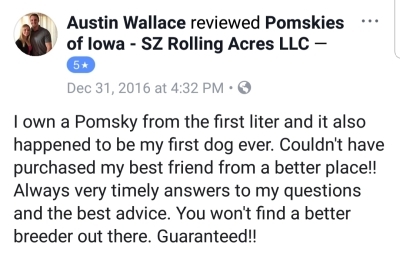 SZ Pomskies is a wonderful place to deal with. Kanzaidy is prompt at responding with any questions or concerns you may have, not only throughout the buying phase but throughout the years to come as a pomsky owner. They worked with me on a pickup date, posted pictures and videos frequently and kept in touch with me throughout the process. SZ pomskies are great quality as well, their temperament is wonderful!! 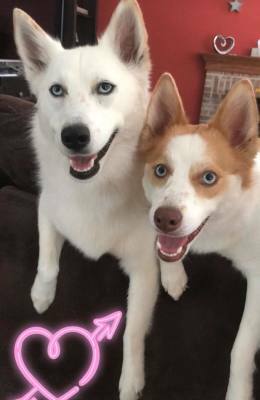 I would recommend these guys to anyone thinking about the pomsky breed!!! 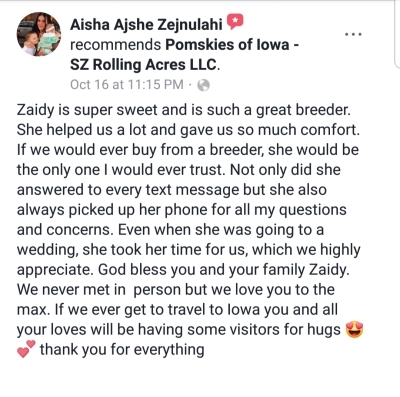 - Jennifer W.
"If your wanting to purchases a life long companion then going with this breed is the way to go and purchasing through Kanzaidy is your best option! My husband and I decided it was time for another dog after losing our girl Maggie. I posted on a group on Facebook and Kanzaidy was the one to respond to me. She has such a great knowledge and love of this breed that we felt very confident to go with her when purchasing a puppy. She answers any and all questions you have. Once the puppies were here she kept us all updated with either videos or photos of their growth!! If your wanting to purchases a life long companion then going with this breed is the way to go and purchasing through Kanzaidy is your best option! Best decision we made and our broken heart was mended with our new girl Gracie!! - Deb S.